Over a decade ago, the immigrant-rights movement seized the national spotlight with a risky act of civil disobedience: It turned May Day 2006 into A Day Without Immigrants, an unprecedented day of strikes and protests in more than 50 cities to prove immigrants’ vital role in the economy, and to demand comprehensive immigration reform. Now, facing a president who threatens to launch even more oppressive border regime, immigrants are once again taking industrial action one workplace at a time—this time, a little bolder, a little angrier, and a little more confident that their communities have their back. Even in a relatively liberal city like Boston, Local 26 felt compelled to stage a preemptive strike as an opening salvo in the coming battle against Trumpism on the local level. And city lawmakers also recognize their plight: Boston has for several years upheld “sanctuary policies,” an informal category demarcating a line of non-cooperation between federal authorities and police on immigration-law enforcement. Since 2014, under legislation known as the Trust Act, Boston police have generally refrained from aiding federal enforcement (though federal agents can generally intervene for specific investigations, with an explicit warrant). Sanctuary policies have enabled nearly 50 cities nationwide, according to Politico, to avoid, to varying degrees, actively collaborating on a federal immigration crackdown (for instance, by rejecting Homeland Security’s “hold” requests for police to detain immigrants on the agency’s behalf, pending federal detention). For workers, these protections provide some reassurance that they can go to work each day or complain to authorities about an abusive boss without having to worry about a cop demanding to see their ID. While the sanctuary policy limits the policing of immigrant communities, it may also have a knock-on effect of helping immigrants defend workplace rights. Sanctuary policies are designed in part to make workers feel empowered when they’re on the right side of the law, and one major labor group, Centro de Trabajadores Unidos en la Lucha (CTUL), demonstrated this after the election by staging a defiant strike for contracted retail janitorial workers. The answer is coming back loud and clear to Washington. Post-election, with the White House gearing up for wall building and mass deportations, some cities have moved toward more open defiance by formalizing their sanctuary policies, including Santa Ana, California, and Burlington, Vermont. 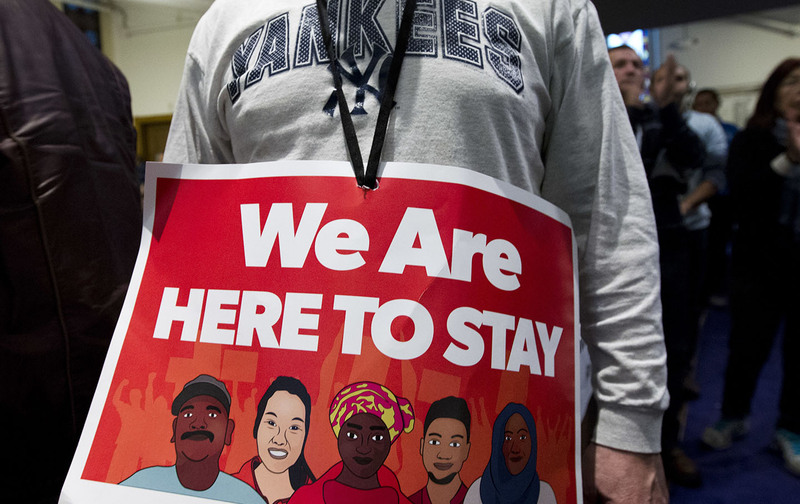 Back in Boston, Local 26 wants employers to go further by instituting sanctuary-type policies for workplaces by committing to “keeping ICE out unless they have a warrant.” They call on both government and employers to reject other regressive measures Trump and anti-immigrant lawmakers have floated, including the revival of so-called “Muslim registries” used to surveil immigrant communities. Whether immigrants seek to hold crooked contractors accountable, or want the freedom to push for decent jobs and organize unions without risking arrest, local legal protections and workplace empowerment go hand in hand. Now with Trump threatening to bring a reign of lawlessness to American cities, the most precarious workers are redefining public security: The issue may not come up in contract talks, but a safe, fair workplace regardless of immigration status is key to social inclusion, promoting economic fairness, and helping communities exercise the rights they do have—especially those without a say in who gets elected to office.